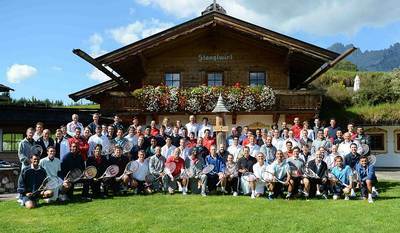 Peter Burwash International (PBI), the world-renowned tennis management company, recently completed its 37th annual meeting at beautiful Bio-Hotel Stanglwirt in Tirol, Austria, site of PBI’s #1 rated tennis camp. The 2012 conference brought together 95 PBI tennis professionals from around the globe for a week of presentations, seminars and workshops — both in the classroom and on the resort’s immaculate red clay courts — for the purpose of continuing education and skill development. Guest speakers included Byron Hero, CEO of Ellesse, PBI’s new clothing and shoe sponsor, Reinhard Wawra and Patrick Woelfler of Wilson Racquet Sports, Chadwick Byrd, President of Tennis Ventures, an all-inclusive, tennis playing tour operator for the grand slam tennis tournaments, and Nicole Heyermann of Western Union Business Solutions, also a PBI corporate sponsor. Winner: Andrea Puca - Tennis Director at Bio-Hotel Stanglwirt, Tirol, Austria. Founded in 1975, Peter Burwash International is the world’s premier tennis management company; specializing in tennis instruction, program development, marketing, operations and daily tennis activities for five-star resorts, hotels and tennis clubs worldwide. Founder and President Peter Burwash, a former Canadian champion, has been an icon in the tennis industry for over 37 years as a world-renowned coach, widely sought after motivational speaker, tennis TV commentator and author of eight books. Recognized for its innovative Tennis For Life™ instruction program and exceptional customer service, PBI directs tennis programs for 55 exclusive properties in North America, Hawaii, the Caribbean, Asia, the Middle East, and Europe.